It is nice to know, after all these years, Ferris Bueller’s Chicago still delights. 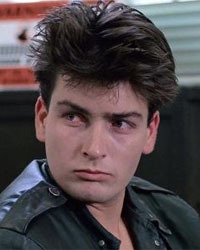 We had run-ins with almost everything Ferris did, with the exception of Wrigley Field and Charlie Sheen, but who knows? We still have two weeks to go. With wind burned cheeks and lips that peeled off when we spoke, we tore through that gusty blast of a town-the true capital of the mid-west. It’s sophisticated, but not elitist; forward thinking, but not crunchy granola; confident, but not narcissistic. It also has a fantastic sense of humor. Wait. Did I just describe myself? BAH Ha Ha! The start of our trip was not terrific. We had a one bedroom apt on Michigan Ave, sight unseen. We’ve had great luck in this department so far, but it ran out here. It wasn’t clean-so that was that. It was also lit with fluorescent light-I don’t mean eco-low watt bulbs. I mean, full on, high school lunch room fluorescent light. If we learned anything from Deborah, it is that under no circumstances should one allow themselves to be poorly lit. She basically lived in a cave after she turned fifty. Luckily, we found the last place available in all of Chicago (at our price point) on North Columbus. We were thrilled to walk, not just into a clean and lovely apartment, but floor to ceiling windows with views of (other hotel rooms and) bits of the Chicago River and Lake Michigan itself. This brings us to our first Ferris activity-a parade. We weren’t in it, but we did watch it. The Magnificent Mile is a stretch of Michigan Avenue that starts just across the river. It boasts lovely shopping and at Christmas time they light it up. They don’t just light it up, of course, they have a big parade book ended by Mickey Mouse and Santa, then some fireworks-then they light it up. A woman at the grocery store told me all about it. The best place to stand, she said, was along the river in front of the Hyatt. Really? That’s one of the hotels we can see into from our apartment. Perfect. We stood out in the cold long enough to see Mickey and Minnie. Just before our feet turned into ice chunks, we went upstairs to watch the rest of the parade from the safety and comfort of our apartment-at least the bits we could see in the corners. This was a good move as the fireworks were loud and according to one little man, scary. Our next Ferris inspired adventure was to the top of the John Hancock building- made accessible by the world’s fastest elevator (I think that’s what they said). The miniature views of the city below are, of course, spectacular. Lastly, we hit the Art Institute of Chicago. It deserves a whole separate post. We just went to see its big prize- the impressionist pointillism by Georges Seurat, Sunday on La Grande Jatte. It did not disappoint. We spent most of our time with the French Impressionists but must say, we really enjoyed the Thorne Miniature Rooms. These rooms are honestly in miniature, the examples below are miniature reproductions-one inch to one foot in scale. Mrs. Thorne was married to a wealthy Chicago so and so (James Ward of Montgomery Ward) and decided to create rooms with her overwhelming abundance of doll house miniatures. Eventually, she commissioned pieces by artisans to her exacting standards to complete her rooms with absolute historical accuracy-quite a hobby. One other delightful attraction I don’t recall Ferris visiting on his day off, was Millennium Park-right up there with the great urban oases of this country. It’s marked by Cloud Gate (left) or what locals refer to as the Bean. It reflects the city. So glad that you liked it. Enjoy the rest of your time in Chicago!